At any time of the day you can observe the different habits in relation to culture, religion and social behavior. Be in a bakery at four o’clock in the morning and watch a family at work with a clear structure of labor on who does what in the work processes. Or observe the common prayer of the local monks, which happens a few hours later. Noting that the daily life takes place for most of the year outside of any premises, it is fascinating to see how the general behavior of the local population is aligned with these life circumstances. From an observer viewpoint, this results in a very deep relationship between nature and spirit, which also becomes evident in the widespread Buddhist mentality and thus strongly influences the individual behavior. For example a funeral, which is according to our Western principles, one of the saddest and most intimate events and therefore also an event itself marked through mourning and sentimental feelings. 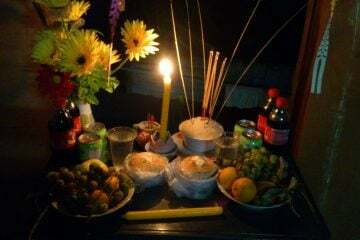 In Cambodia, however, the imminent path of the immaterial soul is celebrated, where visitors, even if they are from a foreign culture, are accepted as equal the same as local family members. Of course, also in this culture, one will carry an inner personal pain for having lost a loved one. This behavior of not engaging in negative feelings can be seen in other situations. For example, if someone is injured by a fall, one should not expect consolation in the traditional sense, but people will laugh to create positive feelings and thereby alleviate the pain. If you are not aware of this, one could easily interpret this behavior as an insult as someone making fun of you. Similar to an injury, one will usually meet only happy faces at a funeral.